Former Aston Villa boss Brian Little has been appointed as Jersey manager until the end of the season. The 62-year-old, who has been Jersey's director of football since November 2014, will be assisted by local coaches Martin Cassidy and Paddy O'Toole. He replaces Jimmy Reilly, who stood down earlier this month. "When I get on the training ground with the lads I'm hoping it will give them a push in the right direction," Little told BBC Sport. "I'm a professional football coach, so there'll be slightly different methods and ways of putting things across, which I hope will help." 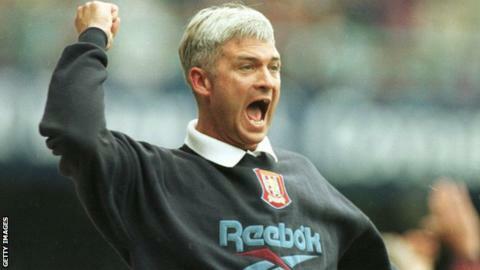 Little, who led Villa to League Cup success and fourth place in the Premier League in the 1995-96 season, will retain his director of football title. The Jersey FA will hold further talks with Little in the summer to see if he will stay in in the role on a longer-term basis. "Right now it's looked upon as a short-term appointment," added Little, who will remain based in the UK. "I would like to get to know lots of other people on the island, but at the moment my thoughts would be to try and set a new way of playing, training and coaching on the island and hopefully hand that over to somebody who could take it on.". His first training session with the island squad will be on Wednesday. "Brian has been working with the JFA behind the scenes for the past 12 months or so but we now have the opportunity to use his expertise to the full and to draw on his many years' experience at the highest level of football," said JFA president Phil Austin. "Martin Cassidy and Paddy O'Toole have met with Brian and they are excited at the prospect of working with him." He is not be the first high-profile manager to take charge of the Jersey side - former Chelsea captain Ron 'Chopper' Harris was appointed in 2001, steering the team to victory over Guernsey in the Muratti Vase the following year. Jersey crashed out of their home Island Games at the group stage last year in their last competitive matches under Reilly, having beaten Guernsey for the first time since 2011 in the annual Muratti clash. Last month, Jersey announced an intention to make a bid to join Uefa and play international football.